We offer the Samsung WS80a with HD LIVE. 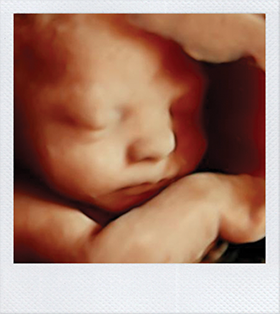 HD is the newest ultrasound technology, it takes your traditional 4D ultrasound and renders it in a life-like tone. You must see to believe! HD LIVE HD is an extraordinary rendering method generating amazingly realistic images of the human fetus from sonographic data. Through the use of an advanced illumination model, HD supports shadows, a virtual light source and advanced skin rendering techniques. HD is an extraordinary rendering method generating amazingly realistic images of the human fetus from sonographic data. Through the use of an advanced illumination model, HD supports shadows, a virtual light source and advanced skin rendering techniques. Image quality is everything when it comes to 3D/4D Elective ultrasounds and we have taken every step possible to ensure that we can provide you withe newest and best technology on the market.